CHRISTINA V JEWELRY offers unique handmade designs by Christina Vanzuela. Styles range from simple pendants to elaborate bib necklaces. Earrings and bracelets are available as well. All pieces are made with gemstones and brass and pewter metals with antiqued finishes. Custom and bulk orders are welcomed, but please inquire for pricing and availability. Please contact Christina Vanzuela at contactus@wearchristinavjewelry.com. 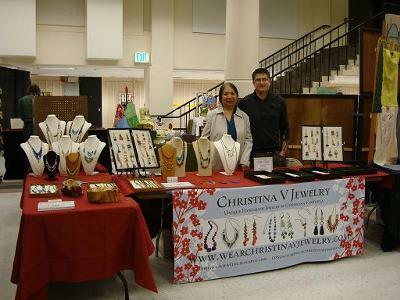 Photos can been seen at www.wearchristinavjewelry.com or christinavjewelry.blogspot.com. I can travel within 45 miles of Seattle.